Beryl Gladys Clayton, 85, 719 Lynn St., Sidney, Ohio died at Wilson Memorial Hospital on Friday, May 23, 1008 at 10:06 PM. She was born on April 16, 1923 in Oxford, England the daughter of William and Priscilla (Fields) Bayliss and they are deceased. She moved to Shelby County in 1947 from England. She was married on March 16, 1945 to Elmer Vernon Clayton and he died on August 19, 1993. Surviving are two children, Richard and his wife Sue Clayton of Wellsville, Kansas and Judith Elson and husband Paul of Sidney, Ohio; eight grandchildren; nine great-grandchildren and two great-great grandchildren; three sisters, Dorothy &quot;Dot&quot; Heritage of Kidlington, England; Barbara Wright of Oxford, England and Mrs. Ronald (Priscilla) Dean of Oxford, England and three brothers, Donald Bayliss of Oxford, England, Tony Bayliss of Blackmill, Wales, England and Roland Bayliss of Sidney, Ohio. Three brothers, Jack, Alex and Ronald Bayliss are decased. She was a member of the Women&#39;s ATS of the British Army. She was a member of St. Mark&#39;s Episcopal, Sidney, and was on the vestry and church board. 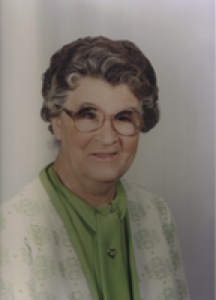 She had been employed as a laborer at Copeland Corporation in Sidney for 33 years and retired in 1985. As per Mrs. Clayton&#39;s request, the body will be cremated. There are no calling hours or services.